You know you’ll be up and down your ladder, so it’s important that you make sure you position it on sturdy and level ground. A good way to test it is to jump on the first and second rungs to make sure it doesn’t shift before you climb. Don’t be among the 500,000 people injured from ladder falls every year! When you look at the pros and cons of gutter guards, one of the big benefits is not having to climb a ladder to clean them ever again. Although a garden trowel works, a better tool is a gutter scoop. What makes it ideal is the front scraping edge. It’s exactly the right shape for gutters and it’s thin enough to get under all the gunk in them. You’ll find that the task is much easier with the right tools. If you’re using your hands at all, you may encounter a rough gutter edge. Thick gloves will protect your hands from cuts. 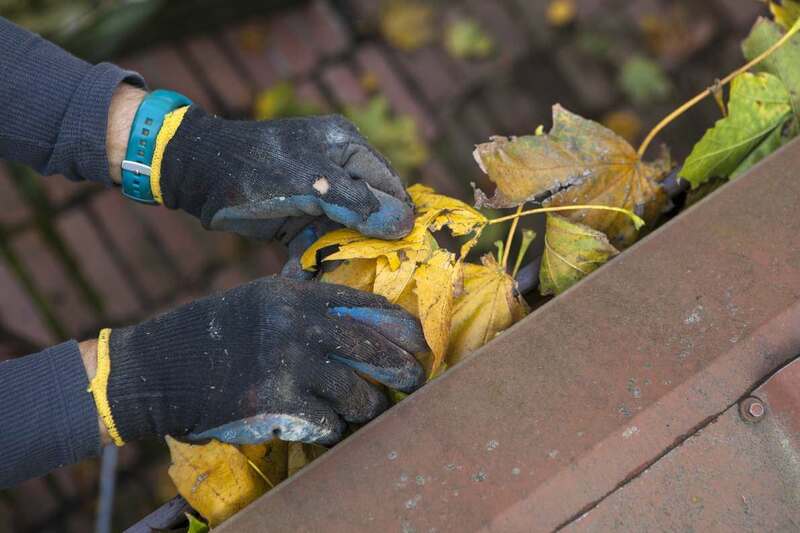 If there are any sharp objects in your gutters, gloves help protect you from those too. Do you follow this recommendation? Gutter cleaning companies will tell you to keep your gutters clean so that you remove the possibility of rainwater runoff and overflowing gutters. Keeping your gutters clean will also reduce corrosion because you won’t have standing water in your gutters. Pressure washers can be a great way to get the last of the gunk out of the bottom of your gutters. Avoid hitting the gutters at too high an angle or you could blow shingles off with a high-pressure stream of water. Look for signs of deterioration, cracks and leaks. Also make sure they’re still firmly attached to your home. If you notice a seam is no longer sealed, completely remove the old silicone with a chisel; once dry, reseal. If you don’t have roof gutter covers, cleaning your downspouts should be part of your gutter cleaning routine. If leaves and debris are clogging it, water won’t drain properly and along with mildew and mud, you’ll end up with sagging gutters. One last bit of advice for homeowners is to purchase a splash block to place underneath the downspouts. It prevents water flowing out of the downspouts from digging a trench next to the house. This can lead to expensive foundation repairs. Have you considered the pros and cons of gutter guards and decided to purchase roof gutter covers? 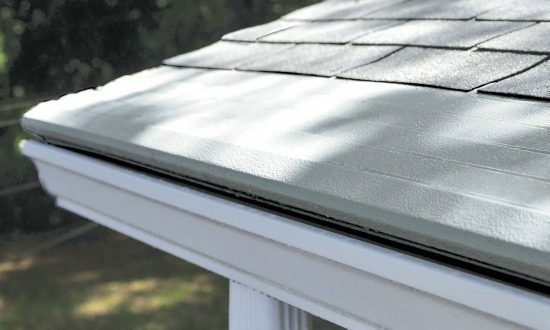 If you’d like to learn more about gutter covers from Gutter Helmet, reach out to us at (800) 824-3772. We’ll connect you to your local authorized distributor for a free estimate.